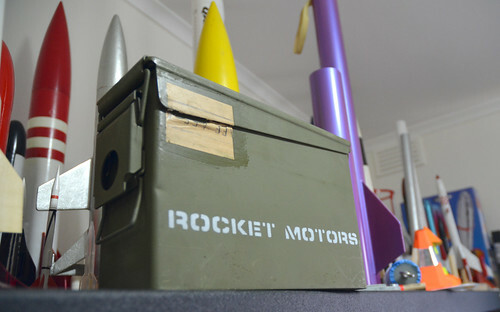 For a long time I've used a plastic storage tub for my low-power BP motors and decided to use this old army surplus ammo box for my motors. I picked this up recently partly because it was cheap ($5) but mostly because it looked cool. When I originally got it, there were some markings in white paint on the outside of the box - denoting the original contents. I removed this with 'goo off' without damaging the underlying green paint. I still need to line the box with MDF before I load it up with motors, but once done, will perfectly fit 18mm motors across it's width.